Concrete is the most abundant man-made material on earth. There's a good chance you're standing on it right now, and it's holding up the buildings around you. But concrete has an emissions problem. Its essential ingredient, cement, has a huge carbon footprint. Cement is the glue that makes concrete strong, but the process of making cement requires superheating calcium carbonate, or limestone, and releases massive amounts of carbon dioxide into the atmosphere. Cement is responsible for 7% of global man-made greenhouse emissions, making it the world's second largest industrial source of carbon dioxide, according to the International Energy Agency. Data from the United States Geological Survey -- the scientific agency of the US government -- reveals that global cement production was responsible for about 4 billion pounds of CO2 emissions in 2017 alone. But a Canadian startup has invented a new system for making concrete that traps CO2 emissions forever and at the same time reduces the need for cement. CarbonCure's system takes captured CO2 and injects it into concrete as it's being mixed. Once the concrete hardens, that carbon is sequestered forever. Even if the building is torn down, the carbon stays put. That's because it reacts with the concrete and becomes a mineral. Related: Experts say algae is the food of the future. Here's why. CarbonCure's system takes CO2 and injects it into concrete as it's being mixed. 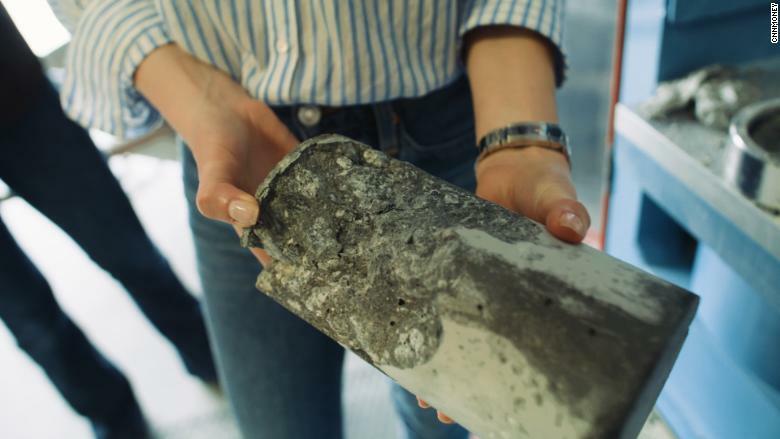 "The best thing about it is the mineral itself improves the compressive strength of the concrete," Christie Gamble, the director of sustainability at CarbonCure, told CNNMoney. "Because the CO2 actually helps to make the concrete stronger, concrete producers can still make concrete as strong as they need to but use less cement in the process." And using less cement is how producers can really reduce emissions. Atlanta-based Thomas Concrete, a concrete producer, has been using CarbonCure's system since 2016. Thomas Concrete says it has since prevented 10 million pounds of CO2 emissions. Justin Lazenby, a manager of technical operations at Thomas Concrete, said the move toward greener tech is a long-term decision the concrete industry should embrace. A cylinder of CarbonCure concrete after undergoing a strength test. "The industry as a whole has always kind of looked at trying to solve today's problems with yesterday's technology, which doesn't really work," he said. Thomas Concrete pays to use CarbonCure and buys captured CO2 from a fertilizer plant where it's emitted, but the company says those costs even out with what they save by using less cement. "We understand that to make environment impact, you have to make business sense," Gamble said. CarbonCure's technology utilizes CO2 that would otherwise be a waste product from factories. Finding uses for captured CO2 is an economically-friendly way of incentivizing companies to capture their emissions. "We're leading that movement right now [by] showing it is possible to take CO2 and turn it into something that makes financial sense," Gamble said. "This concept of beneficial reuse of CO2 is expected to be a one trillion dollar industry by the year 2030." 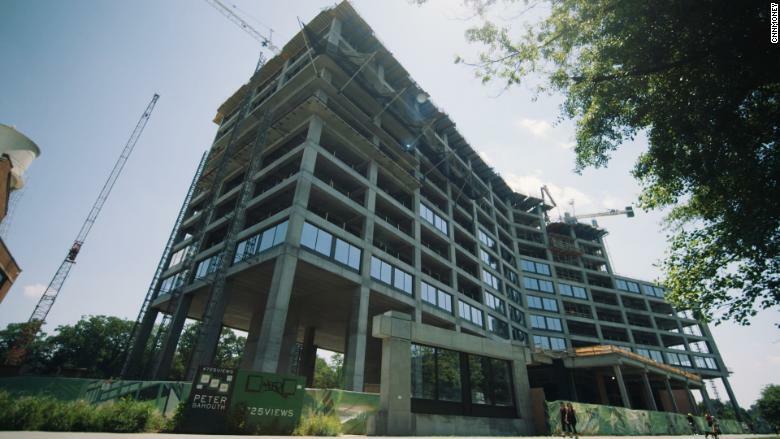 A new mixed-use development in one of Atlanta's trendiest neighborhoods, called 725 Ponce, is a real-life example of the impact of building with greener concrete. When it opens in 2019, it will become the largest structure ever made with CarbonCure concrete. Ultimately, the 360,000 sq. ft. office building, which will have a Kroger supermarket on the first floor, will save 1.5 million pounds in CO2 from being released into the air -- the same amount 800 acres of forest would sequester in a year, according to Gamble. The building is a step in the right direction, but CarbonCure is far from widespread adoption. Right now, only 90 concrete plants in the US and Canada are using their technology -- a small fraction of the estimated 5,500 plants in the US alone. CarbonCure isn't the only company working to make concrete more environmentally friendly, but it's one of the first to market. Carbicrete and Carbon Upcycling are two other startups working on more sustainable solutions for concrete. 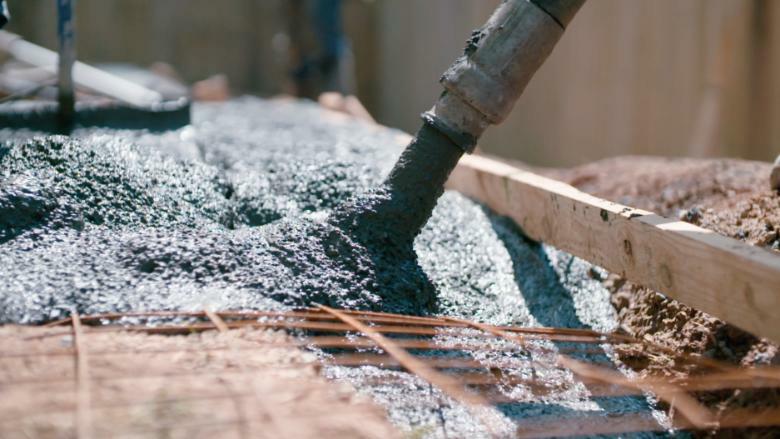 Gregg Lewis, executive vice president of strategy for the National Ready-Mix Concrete Association, said these types of technologies will help push the concrete industry toward a more sustainable future. "[It will] offer a huge advantage to how we build as an industry," he said. CarbonCure's Gamble noted if the industry is able to reduce 5% of its carbon footprint, that is a significant change from where it is right now. "If this technology is deployed across the globe, we could reduce about 700 megatons of CO2 each year. That's the same as taking 150 million cars off the road every year," Gamble said. Although concrete isn't going away anytime soon, it appears there is room to make all that grey a bit greener. "Everytime I see concrete being made, I see it as a missed opportunity to save CO2 emissions," Gamble added. "Maybe it will take 20 years; maybe it will take 50 years. Maybe something crazy will happen and it will happen in five years. But we're starting to see that process."